Ruminations: SC may legalize pot, and this libertarian doesn't care. SC may legalize pot, and this libertarian doesn't care. Here's an odd thing. Here in SC there's a movement to legalize medical marijuana, and those of my friends who know I'm a libertarian are surprised to learn that I have no enthusiasm for this bill. How, they wonder, can I be libertarian if I'm not for drug legalization? It's because I am a libertarian. I do not favor unnecessary laws that tell me what I can do any more than I favor unnecessary laws that tell me what I can't. I'd rather see the laws that limit my freedom repealed than laws that treat the government as a master that grants me leave to do only those things for which I'm granted permission. In other words, I don't want to see drugs legalized. I want to see them decriminalized. I want to remove the bloody laws that shouldn't be there in the first place. 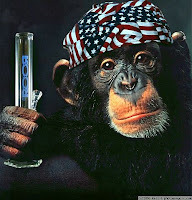 Passing Yet Another Law is not a step toward Libertarianism, and as I don't personally a great desire to fire up a doobie, this ain't my monkey - ain't my circus. The counter argument is that permissive laws at the State level counter restrictive laws at the Federal level. First... that just means we have too many laws at both State and Federal level. We can't dismantle them by piling more on. Those Federal laws clearly shouldn't exist, and are not authorized by the Constitution except through tortuous re-interpretation of the plain text. Second... it doesn't really work. State law doesn't trump a conflicting Federal law; and the only thing keeping marijuana users in permissive states from being arrested is a lack of initiative on the part of the Federal authorities. Decisions about prosecution are still left to the discretion of the federal government. While a local law means that patients may be able to use medical marijuana if the Feds allow it, in my view, backing such a bill has nothing to do with being a Libertarian.